Hay fever sufferers who underwent 12 acupuncture sessions experienced fewer symptoms and required less antihistamine medication compared to a control group, researchers from Charite-University Medical Center, Berlin, Germany, reported in Annals of Internal Medicine. Hay fever, medically known as seasonal allergic rhinitis, is caused by allergies (usually) to plant pollen. Symptoms include a stuffy nose and itchy eyes. Standard treatment includes antihistamines. However, many patients find that antihistamines do not work. People who are not happy with antihistamines, as well as those who prefer more natural remedies frequently use non-standard treatments, such as acupuncture. Acupuncture is an ancient Chinese procedure that uses special needles that are inserted into specific points on the body to either prevent or treat medical conditions. Over the last 30 years mainstream medicine has increasingly come to recognize acupuncture as both effective and safe for many disorders. However, previous studies on acupuncture treatment for hay fever have been inconsistent. Sham acupuncture plus RM group. In sham acupuncture, the needles are inserted only superficially and into areas of skin that are not traditional acupuncture points. Twelve treatments were administered over eight weeks in the first year. Patients in all three groups were allowed to take antihistamine medication whenever they had hay fever symptoms. They found that overall, those in the acupuncture plus RM group reported better improvements in their symptoms over the eight-week period of treatment, as well as needing fewer antihistamine drugs, compared to those in the other groups. However, within eight weeks of ending their treatment, the benefits of the acupuncture were gone. Dr. Brinkhaus, a medical doctor and qualified acupuncturist, said that does not necessarily mean that acupuncture's benefits wear off. The improvements in symptoms may not have been enough to make much of a difference in people. The researchers are not sure how acupuncture might have reduced allergy symptoms. Dr. Remy Coeytaux, co-writer of an Editorial that was published with the study, said that it is time for allergic rhinitis studies to move beyond testing real and sham versions of acupuncture, and to compare it to with other therapies. Some doctors have wondered why the researchers did not compare acupuncture with nasal sprays containing steroids, which are strong anti-inflammatory drugs and help with many allergy symptoms. 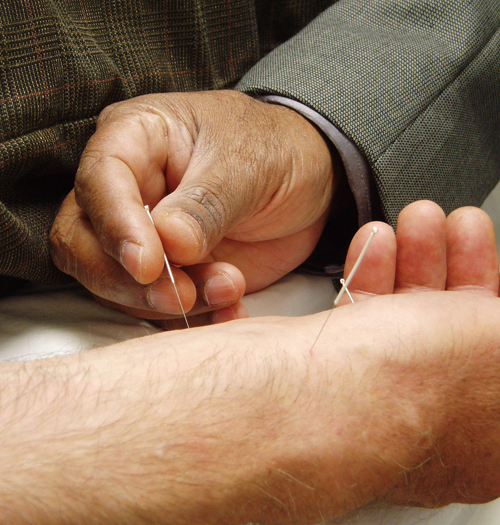 Acupuncture is effective in treating 28 illnesses/conditions, according to WHO. Evidence points to possible efficacy in many more, WHO adds. A significant percentage of patients with migraines and/or headaches have found that acupuncture helps their symptoms. Twice weekly acupuncture treatment has helped patients with the debilitating symptoms of xerostomia (severe dry mouth). Researchers from the University of Seoul, South Korea, showed that acupuncture helps relieve some of the symptoms of Parkinson's disease. "Acupuncture in Patients With Seasonal Allergic Rhinitis: A Randomized Trial"
Nordqvist, Christian. "Acupuncture Relieves Hay Fever Symptoms." Medical News Today. MediLexicon, Intl., 20 Feb. 2013. Web.